The last few Cook the Books Club picks have been pretty humorous: Lunch in Paris, A Homemade Life and Garden Spells. Although these two memoirs and a novel had very serious moments and some grief-stricken passages, there were definitely parts that had me laughing out loud. The current pick, Harlot’s Sauce by Patricia Volonakis Davis, was much different for me. There was so much angst and drama in the first half of the book—she tries to please her Italian American parents, tries to figure out what it means to be an Italian-American and then moves on to trying to please (and re-please) her husband. When does she please herself? She thought she had found a kindred spirit, someone who understood her “other-American” self in her Greek-American husband, Gregori. There were definitely clues that this match was doomed from the beginning. Her dad’s categorical dislike for Gregori. Her feelings of being the alpi among his family. It took her so long to find her way to happiness, but she finally made it. Patricia’s description of her encounter with flying Greek cockroaches. The grandmothers’ first meeting, both outraged at what the other was wearing (one in traditional black, the other in a bit more flamboyant outfit). The best man’s “Drag Queen” like tastes when picking out his special wedding charges. 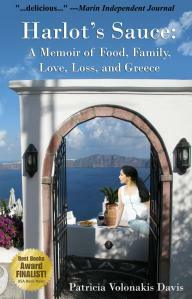 Thank goodness there was this humor and Patricia’s ultimate personal and business triumphs in Greece. I was rooting for her all the time. I had a difficult time trying to figure out what to make for my recipe inspired by Harlot’s Sauce. The obvious choice would be a Greek dish like baklava or moussaka or the most obvious choice, pasta with puttenesca (the Harlot’s Sauce from the book’s title). I wanted to make something a bit more inspired than that. I kept going back to “the first date” and Gregori and Patricia bonding over pizza. 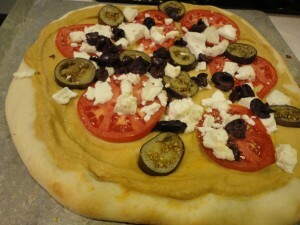 So I decided to make a Greek-inspired Pizza. OPA! In the bowl of a stand mixer, stir together water, yeast and honey. Let set for 5 minutes. Using the dough hook, mix in 3 cups of flour and olive oil. Knead with dough hook for about 5 minutes. Add more flour if necessary. The dough should be smooth and shiny. Place dough in an oiled bowl and let rise until doubled (30-45 minutes). Punch down pizza dough and divide in half. Take half the dough and press on a prepared baking sheet. Press and stretch dough into a free-form shape. 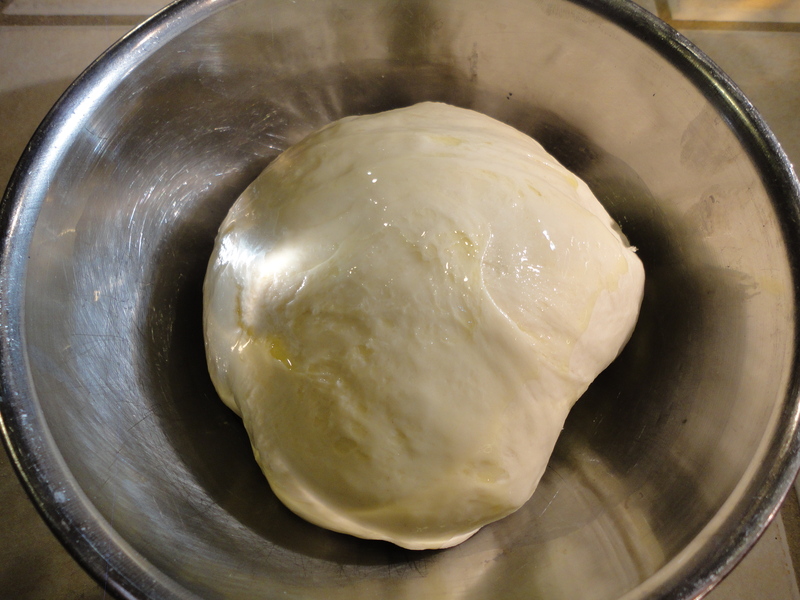 (Freeze the other dough half or make another pizza.) 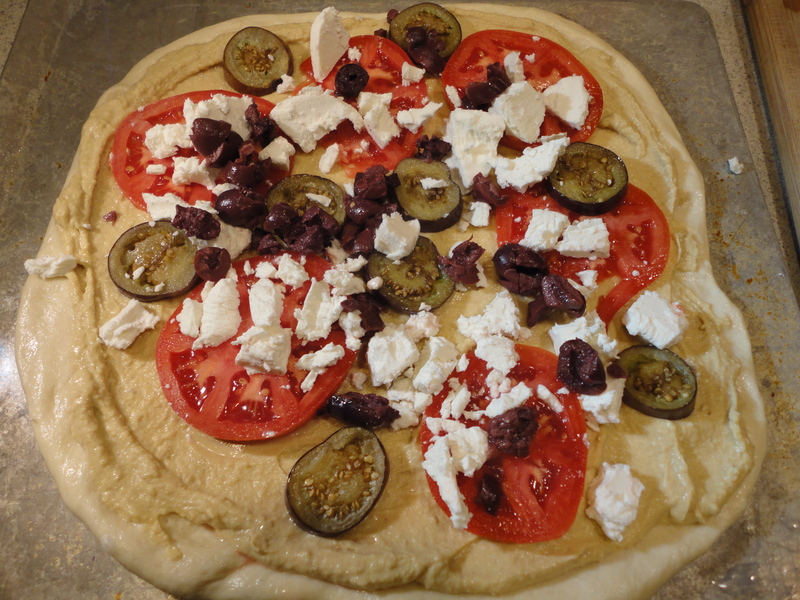 Spread hummus on dough, arrange tomato and eggplant slices, then sprinkle with chopped olives and goat cheese. Place in 400 degree oven and bake about 20 minutes or until done. Remove from oven. Sprinkle with fresh ground pepper if desired. I absolutely love hummus so I used a 1/2 cup. I used prepared hummus because I was afraid my home-made version might separate in the oven. I utilized the final tomato from the very last farmers’ market and some baby eggplant that I had been saving in the crisper from the very last of the garden. And, darn it, I should have opened a jar of pickled roasted peppers for this pizza too (but I am kind of hoarding them). I hope you enjoy this take on an Italian favorite with a bit of Greek flair and I hope you check out Harlot’s Sauce and the Cooks the Books Club. Thanks to Rachel, Debbie and Jo for hosting Cooks the Books. What’s up next? Rachel has picked Outlaw Cook by John Thorne and Matt Lewis Thorne (NY: Farrar, Straux, Giroux, 1992) for the next round. I have my copy on the bedside table! 18 comments to CTB Post for “Harlot’s Sauce”: Greek Pizza, Anyone? This pizza sounds really good, with all my favorite things on top. Gotta get cracking on my own Harlot’s Sauce post. Great review, and the pizza looks ridiculous (in a great way)! A book club with foodie themed books?!?! Where has this been all my life? How fun, a book club and then cooking inspired recipes…I may be inspired to join! 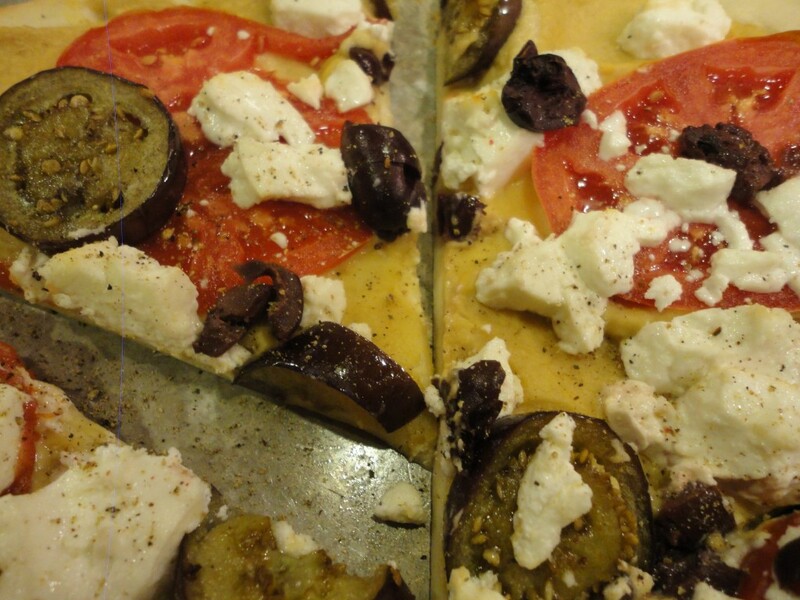 Clever idea to do a Greek pizza! You came up with a delectable Greek Pizza, which I am planning to try soon as well. Good choice. I am delighted that you’ve chosen to read Harlot’s Sauce as part of your fantastic “Cook the Books” series, and am blown away by this fabulous recipe. Many thanks for the honor! I am loving your pizza with that hummus! What a great pick for this round. What a great recipe. Very in-depth review too, good luck! Your pizza is making my mouth water! I wish that I had some right now. I love hummus but no one else in my house does. Boo. I think I will have to try this the next time I get a night all to myself! Good choice of dish! Your pizza looks very inviting. What an amazing-looking Mediterranean pizza. I love roasted or grilled vegetables on pizza. And, your pizza looks fabulous!